Suppose your dish is moved out of alignment by wind or weather. Maybe you plan on calling DIRECTV to fix it, or maybe you want to make sure it’s as good as it can get. You’re probably planning on loosening the alignment bolts and moving the dish from side to side first, as that’s the most likely point of movement. 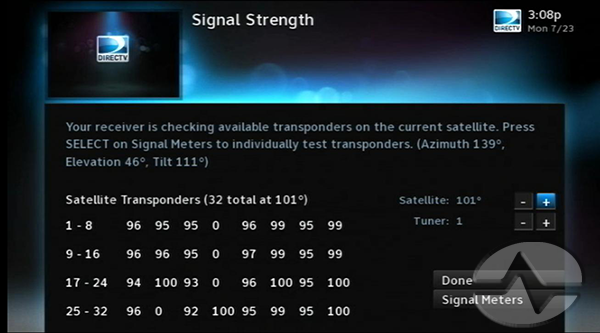 Before you do, take a moment and look at the signal strength screen in DIRECTV receivers and what those numbers mean. First of all, the bad news: For you old-school guys hoping those numbers would closely correspond to dBs or carrier-to-noise ratio, I’m sorry to be the one to disappoint you. The signal strength numbers seem to be a percentage based on some confidential numbers that indicate the maximum possible signal. It does seem more directly related to c/n ratio since my testing shows that it’s possible to pad the signal as much as 20dB and see no change in signal strength through the receivers. On the other hand, using a cable known to be noisy seems to have a strong correlation to signal strength. For the more amateur folks, all you need to know is that the signal strength is a number between 0 and 100 where 100 is the best signal you can get. As you see in the screen above, some zeroes are normal. This indicates that a particular transponder isn’t being used in your area. Signal strength in the 90s is great. There’s no need to fine tune any further if your signal strength is that high on all satellites, even if it used to be higher. On the other hand, signal strengths in the 80s on a sunny day may mean that you might want to try harder. Heavy rain or snow on the dish may mean that there could be signal problems when the weather gets bad… just when you want to settle down in front of the TV. In warmer, drier climates signal strengths in the 70s may be no problem at all. Without serious rain to contend with, Southwesterners don’t have to worry much about loss of signal due to weather. However, if you see something in the 60s or lower, it’s probably time to get that dish moved a little bit or look into what is causing the issue. Consistently bad numbers are more likely to be caused by obstructions (like trees) while numbers that fluctuate could be a sign of a cable going bad or a loose connection. Has AT&T really launched its last satellite? DRE Installers: Are you leaving a regular remote behind?